This relates to AR but instead of a neutral atom, we have an ion. Anions gain electrons, thereby decreasing their effective nuclear charge, Zeff, and extending their ionic radii. This occurs when the # electrons outnumbers the # protons and nucleus’s attractive force is not strong enough to hold all the electrons in. 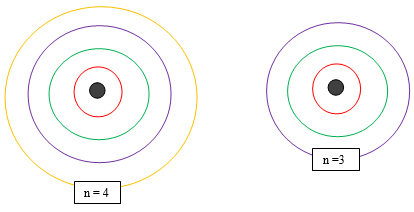 Cations lose electrons, thereby increasing the proton:electron ratio, thereby increasing their effective nuclear charge, Zeff, and decreasing their ionic radii. If they enough electrons to clear out their valence shell altogether, then they can close the shell, decreasing their “n” value and also decreasing their ionic radii even further. The Zeff or attractive force of the positive nucleus on electrons is directly related to the # protons. More protons, more + charge, more pull. The greater the Zeff, then the greater the pull on the surrounding negative electrons and more compressed the atom and its radius becomes. 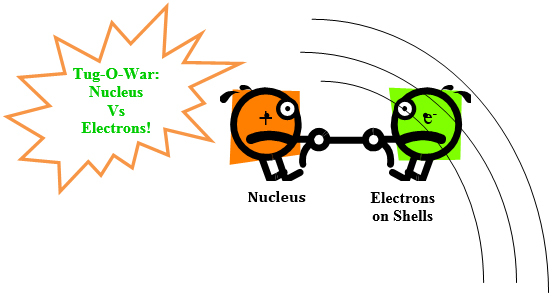 It’s like a tug of war between the nucleus and the electrons.